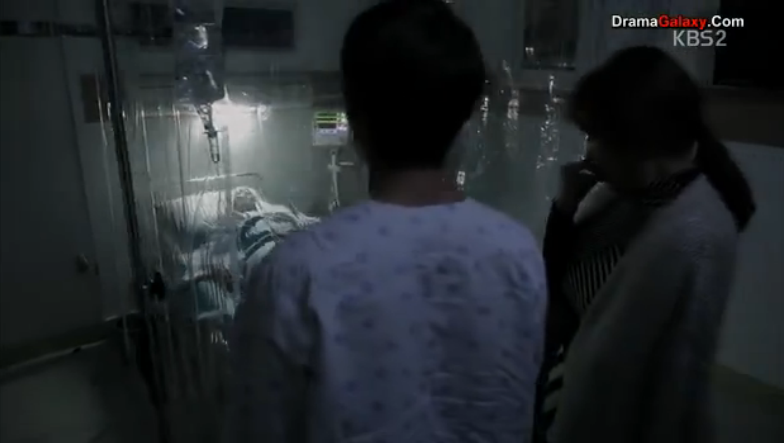 The 14th episode starts with Mrs. Ahn in the infirmary and Woo-Hyun and Seul-Bi are with her and she calls out for Sung-Yeol and Woo-Hyun leaves the room because she is going to be okay. Seul-Bi goes to the roof and fights with Sunbae and he interfered because he wants things to go back to the way they were. Seul-Bi disagrees with him and tells him that she is never going back to being an angel and he tells her future with Woo-Hyun will not be good. At the shop the kids from school give Seul-Bi and Woo-Hyun a hard time for living together and her arm starts glowing when Jae-Suk gets to close to her. Mrs. Ahn tells Seul-Bi that she wants her to move to her place because the rumors are hard on Woo-Hyun and she doesn’t like them living together alone either. Seul-Bi tells her that she will think about it. Jae-Suk is with his tall friend and they are calling Byeong-Wook the shorter guy and he isn’t answering. He sees Da-Yeol a girl from school go into a club and Jae-Suk tells him to go find Byeong-Wook. Mrs. Ahn is going through Sung-Yeol’s room to find her necklace and he finds her and tells her that he threw it out and she starts hitting him and he grabs her arm and then his dad walks in and gets angry and slaps Sung-Yeol. Mrs. Ahn tries to calm down his dad and tells him that is was her fault for going through his room and he tells her not to treat him like someone else’s child but her own. Seul-Bi and Woo-Hyun at home get awkward when using the bathroom and watching dramas with kissing. Sung-Yeol asks his dad if Seul-Bi can live with them because of the rumors and his dad is mad at him and makes him apologize to Mrs. Ahn. Mrs. Ahn talks to Sung-Yeol later and tells him that he doesn’t want him to be hurt but she especially doesn’t want him to hurt Woo-Hyun and Sung-Yeol is upset and tells her that she is finally being honest and that he just wants to hurt Woo-Hyun. At school everyone is talking about Woo-Hyun and Seul-Bi living together and makes them uncomfortable. While cleaning up the gym Seul-Bi tries to help Sung-Yeol but he gets mad and dumps all the balls and she falls. 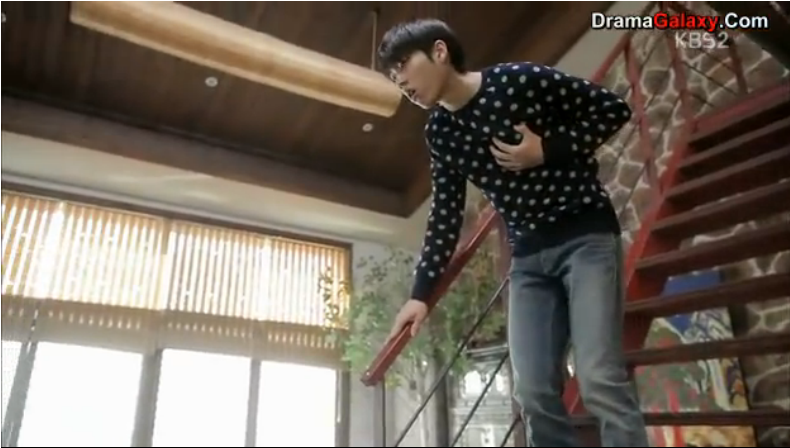 Woo-Hyun helps her up and gets mad at Sung-Yeol. Sung-Yeol and Seul-Bi talk and he threatens to tell everyone about Mrs. Ahn and Woo-Hyun and she tells him that it is a secret for Sung-Yeol’s sake so that nothing is taken away from him. Sung-Yeol tells her that she is his weapon now and she should think about how to protect Woo-Hyun. Mrs. Ahn talks to Woo-Hyun and tells him for everyone’s sake he should help convince Seul-Bi to come live with her. Seul-Bi locks a lock on the fence outside the restaurant and tells him that she is locking her heart here and is never going to leave but her body needs to leave. Woo-Hyun tells her not to go and that it hurts if she leaves her heart here and she says she wants to protect him. They go over to Mrs. Ahn’s house to drop off Seul-Bi and Sung-Yeol meets them. Jae-Suk and his gang are teasing the student that Byeong-Wook helped before and Byeong-Wook comes up to them and sends her away and they ask why he hasn’t been in school. Jae-Suk is mad at Byeong-Wook for talking back to him and punches him. Woo-Hyun finds the dolls at home and brings them over to Mrs.Ahn’s and looks for Seul-Bi in the window. Seul-Bi went to Woo-Hyun’s house but he isn’t there. Jae-Suk finds Da-Yeol walking with older men and he confronts them and they start beating him up. Their old teacher is patrolling and finds Jae-Suk and protects him and gets beat up as well. Da-Yeol pretends she doesn’t know Jae-Suk and runs away. Ki-Soo finds Byeong-Wook beat up on the ground and helps him over to Woo-Hyun’s house and they both take care of his wounds. Sung-Yeol finds the dolls Woo-Hyun brought and left there and Seul-Bi finds them and Sung-Yeol gets mad at her for always talking about Woo-Hyun and then he tries to see her wrist but Mrs. Ahn interrupts them. Mrs. Ahn tells Seul-Bi that she has to stay away from Woo-Hyun and even takes away her cellphone. Seul-Bi wakes up the next morning and makes breakfast for everyone and Mrs. Ahn tells her not to do it because they have simple breakfast and it makes her feel bad. Sung-Yeol comes and eats the food and tells her to do so and Seul-Bi gets up and stumbles and he figures out she has a fever. She tries to go to school but Sung-Yeol tells her not to and she tries to go but he doesn’t let her out of her room and she agrees to stay home. 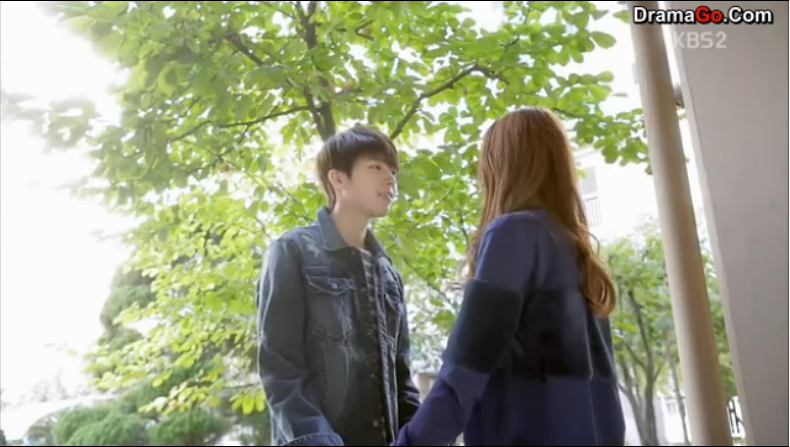 Woo-Hyun waits for Seul-Bi and when he sees Sung-Yeol he asks but he doesn’t tell him. Woo-Hyun asks Mrs. Ahn where Seul-Bi is and she doesn’t know and she gives him her cellphone to give back and she tells him that she will check on her and that he shouldn’t. Woo-Hyun finds Sung-Yeol outside and tells him to give Seul-Bi her cellphone back and he sarcastically tells him that he should live there with his mom at his place and Woo-Hyun replies sarcastically that he should live with his biological mom because then he could see Seul-Bi. When they leave a policeman with a mask on takes it off and it is Sung-Yeol’s dad and he overheard everything. Jae-Suk followed Mrs. Ahn and sees Sung-Yeol come out of the same house and he takes a picture. Jae-Suk goes and shows it to Woo-Hyun and Woo-Hyun talks back to him and doesn’t tell him anything and makes him mad. 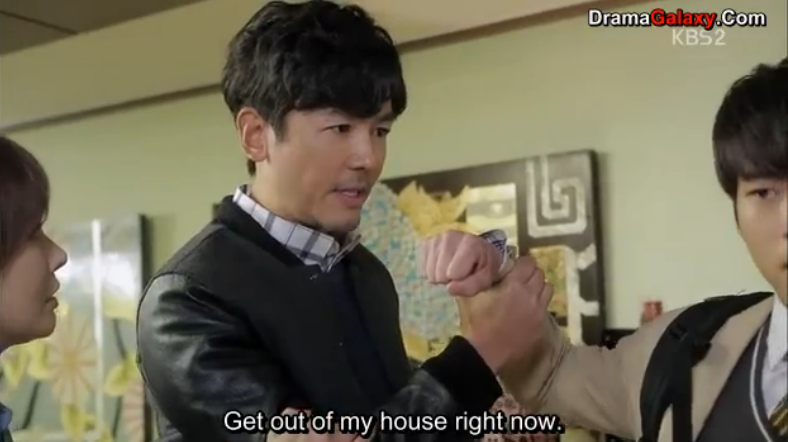 He threatens him that if he lets Byung-Wook stay here again he will destroy the store like he destroyed him. Woo-Hyun goes to the roof and while he is there Sunbae uses his magic to move the clothes on the line and freaks him out. Sung-Yeol’s dad comes home and confronts Mrs. Ahn and tells her that she is a terrible mother. Woo-Hyun comes over and Seul-Bi answers and he is wondering if she is okay and she reassures him. He wrote on his hand that he missed her and Sung-Yeol comes back with her medicine and asks why he is there and Woo-Hyun answers he won’t have what is his taken away from him anymore and this ends episode 14.